The School of Art at Montana State University is pleased to announce the opening of the Spring 2019 BFA Thesis Exhibition at the Helen E. Copeland located on the second floor of the School of Art in Haynes Hall, Bozeman, MT. The show will be on exhibit Wednesday, April 17th through Friday, May 3rd, 2019. A reception will be held on Friday, May 3rd from 6:00-8:00 p.m. and will be free and open to the public. Hors d’oeuvres will be served. On view will be the thesis works of 12 emerging artists graduating with their Bachelors Degrees in Fine Art. The following disciplines and concentrations will be represented: painting, ceramics, printmaking, sculpture, and metalsmithing. The following students will be in the exhibition: Ben Blackwood, Christy Burgard, Josh Eder, Ashley Gangle, Jenna Hawthorne, Jane Herzog, Jessica Jones, Hans Foster Million, Elsa Nordberg, Holden Roberts, Jack Schwarze, and Ally Sweet. As always, the issues and topics covered in this work range. To name a few, Blackwood, Schwarze, and Gangle students pledge allegiance to the raw qualities of their materials, while Sweet and Pratt discuss their experiences with conditions such as synesthesia, ADD, and depression. While Herzog looks into the merging or technology and craft, Million investigates nomadic transient cultures through metalsmithing. Jones finds she follows in her mother’s footsteps as Hawthorne questions the fleeting nature of experience. Through the use of bombastic color, Burgard illustrates Greek mythology, Eder is influenced by pop culture and graffiti, and Norberg facilitates the use of space with the juxtaposition of fabrics and welded steel. Roberts, who recently won a grant to install work in the new Norm Asbjornson Hall, will have a reception celebrating his installation prior to the BFA reception in Haynes Hall. Please check the Helen E. Copeland website for developing details on this event. In combination, these students have received grants, completed residencies around the country, and have had their own solo shows or participated in group shows during their time at Montana State University. This cohort exemplifies some of the best work that the MSU School of Art has to offer and we are personally excited to witness their future endeavors. 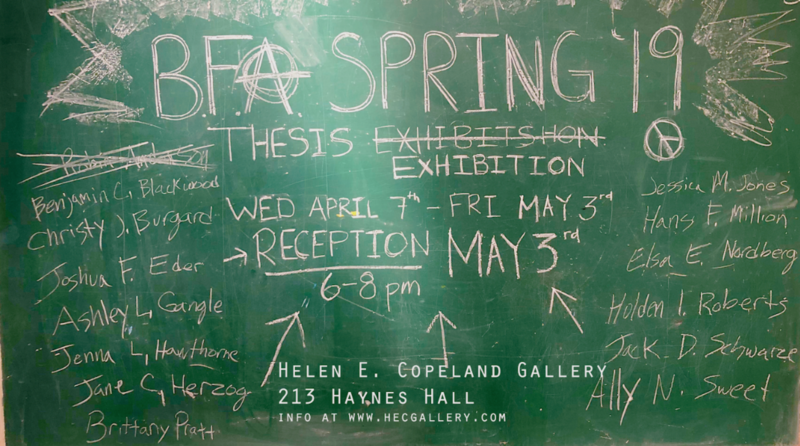 The Spring 2019 BFA Thesis Exhibition will be on view from Wednesday, April 17th – Friday, May 3rd, 2019 in the Helen E. Copeland Gallery. The HECG is located on the second floor of Haynes Hall, across from the Aasheim Gate off of 11th, with the Ski Swing out front. Please note that the parking passes are required for parking during the business day (6AM – 6PM). Gallery Hours: Monday – Friday, 9AM – 5PM/Closed on weekends. For more information on this exhibition the 2019 Spring BFA Thesis Exhibition or on the Helen E. Copeland gallery in general, please visit www.hecgallery.com or follow us on Facebook at facebook.com/msuhecg. The Helen E. Copeland Gallery and the School of Art at Montana State University are excited to announce Beyond the White Cube, the Master of Fine Arts thesis exhibition of Jon Bashioum. The exhibition will take place in Helen E. Copeland Gallery in Haynes Hall on the Montana State University campus in Bozeman, Montana, April 8th – April 12th, 2019. An additional exhibition will take place April 10th from 5:00 pm – 8:00 pm in the Beyond Gallery, Bashioum’s mobile gallery, which is being hosted by Bunkhouse Brewery located at 1216 West Lincoln street Bozeman, Montana. Public receptions will be held April 10th 2019 from 5:00 pm – 8:00 pm at both the Helen E. Copeland Gallery and Bunkhouse Brewery. Bunkhouse Brewery is only a short 0.4 mile walk due South of Haynes Hall. Bashioum’s mugs will be available for purchase at Bunkhouse with proceeds going to S.L.A.M. (Support Local Artists and Musicians). Beyond the White Cube will feature functional and sculptural ceramic vessels that explore the place of art in the gallery and in our everyday lives. Works shown in both the Helen E. Copeland Gallery and the Beyond Gallery explore the juxtaposition of standard white-cube gallery practices versus alternative display strategies. Bashioum’s thesis questions the appropriateness of the white cube as the standard by which we experience art and propose that, at times, alternative spaces may be a more effective way to exhibit and discuss art. Bashioum is a wood fire potter that was born in North Carolina and moved away shortly after. Having never seen the place where he was born, he took to rambling around the country and has adopted Montana as his home. After earning his bachelor’s degree in music from Bethany College in West Virginia, and narrowly missing an art degree due to a clerical error, Jon pursued a variety of global experiences in ceramics. The idea of an area being “home” interests him due to his perennial lack of a location designated as home. His explorations of utilitarian wares represent a curiosity in the regional lifestyles that can only exist from long-term inhabitation, but are best appreciated by the traveler. With his eyes ever on the road, Bashioum intends to take the Beyond Gallery on the road for exhibitions and workshops to promote local artists while maintaining an active studio practice. The Helen E. Copeland Gallery is located on the second floor of Haynes Hall, across from the Aasheim Gate off 11th, with the Ski Swing out front. Please note that the parking passes are required for parking during the business day (6AM – 6PM). Gallery Hours: Monday – Friday, 9AM – 5PM/Closed on weekends. For more information on this exhibition or on the Helen E. Copeland gallery in general, please us www.hecgallery.com, on Facebook at facebook.com/msuhecg and Instagram @helen.e.copeland. More information about SLAM and Bunkhouse Brewery can be found at www.slamfestivals.org and www.bunkhousebrewery.com. Online information about Bashioum and the Beyond Gallery can be found online at www.jonbashioum.com, www.thebeyondgallery.net, and on his neglected Instagram @jon_bashioum and @the_beyond_gallery. The Helen E. Copeland Gallery and the School of Art at Montana State University are pleased to announce the opening of Ontogenesis, the Master of Fine Arts thesis exhibition of Megan Sprenger. The exhibition will take place at the Helen E. Copeland Gallery in Haynes Hall on the Montana State University campus in Bozeman, Montana, March 11th -15th, 2019. Sprenger’s thesis defense will take place March 11th at 11:00 am in the Helen E. Copeland Gallery. There will be a public reception for Ontogenesis on Thursday, March 14th, from 6:00 pm – 8:00 pm. All events are open to the public. Ontogenesis is a body of work comprised of sculptural objects and drawings that allude to architectural spaces as a mirrored and collective subconscious communication within the human growth. This development is both an internal and external growth of humans as they are shaped by the spaces they live and breathe. Finally, Ontogenesis is the second of the five MFA candidates. Following Ontogenesis will be Alyssa Willard, who will be presenting her thesis exhibition on Monday, March 25th – 29th, 2019. The Helen E. Copeland Gallery and the School of Art at Montana State University are pleased to announce the opening of The Material Verse, the Master of Fine Arts thesis exhibition of Matthew Levy. The exhibition will take place at the Helen E. Copeland Gallery in Haynes Hall on the Montana State University campus in Bozeman, Montana, March 4th– March 8th, 2019. Levy’s thesis defense will take place March 5th at 11 am in the gallery. There will be a public reception for The Material Verse on Thursday, March 7th 2019, from 6:00 – 8:00 pm. All events are open to the public. The Material Verse explores the role of materiality through the use of indigenous Montana clays and rocks. The culmination of Levy’s research into sourcing local materials, his sculptural works, and his clay panels seek to invoke the essence of the Montana landscapes and bring agency to these natural resources. The areas surrounding Western Montana are filled with a deep and rich history of mining and stewardship, where the resources of the earth were harnessed under the promise of progress and advancement. Butte is no stranger to the needs of industry, and through sourcing viable ceramic materials in the remains of the town’s once booming mining industry like the Slag walls of Silver Bow Creek, Levy seeks to give these spaces a voice. Matthew Levy received his BFA from University of Wisconsin, River Falls. He has been focused on woodfired ceramics for over 20 years and has exhibited nationally and throughout the Midwest region. A grant recipient of the DSEL Interdisciplinary Education Program, Levy’s research on sourcing indigenous materials has been recently cited in the book, Undergraduate Research in Art (Routledge Publishing, 2019). This has given his career a boost as Levy has been awarded a a residency in Tasmania, Australia for April/May 2019 where he will be participating in the 2019 Australian Woodfire Triennale. Levy will also be presenting at NCECA 2019 Minneapolis: Claytopia in March, bringing MSU’s International Wild Clay Research Project to a broader audience. The School of Art at Montana State University is pleased to present Red Apples: Faculty and Staff 2019, on view Wednesday, January 9th – Friday, February 1st in the Helen E. Copeland Gallery in Haynes Hall on the Bozeman campus. In conjunction with Across the Divide at the Holter Museum of Art in Helena from January – April, Red Apples will display the many techniques and media used by the School of Art faculty and staff. Every three years, the Helen E. Copeland Gallery hosts an exhibition of work by the School of Art faculty and staff to allow every cohort of students to see the work of their mentors. Such exhibitions illustrate that artists often straddle two careers: one of passion (their practice) and one to economically support their practice. Artists are self-driven members of the community, who attempt to balance their responsibilities and professional obligations with their purpose and passion. For Red Apples, Professor and Director of the School of Art Vaughan Judge chose a photographic piece entitled “Sisyphus” which sheds light on the irony of toxic masculinity in the 21st century. A Neo-conceptualist photographer, Judge’s work captures tableaus of his design, in which every detail is a conscious decision, ultimately tallying to a larger commentary on the ills of society. Judge is also celebrating his newest publication, Undergraduate Research in Art published by Routledge Press. Dean Adams, nationally and internationally shown ceramicist provides an eclectic look to his pieces of phallic interpretation in ceramics. Using humor to make his subject matter more approachable, Adams provides a commentary on how unbridled masculinity does not need to be pornographic, abusive, or reactive. With his wide array of ceramic work, along with his many roles in organizations such as the Wild Clay Research Project at MSU and Integrative Teaching International, Dean mentors students on not just artistic practice, but also how to be successful through many varying ventures and ideas. Drawing and Painting professor Rollin Beamish’s sophisticated use of graphite enmeshes his political and social commentaries, often with ironic qualifications. His pieces are as profoundly skillful and as they are conceptually layered, and often bring attention to the architecture of the gallery space through his use of wall stencils and vinyl applications. Hours can be spent of his work, deciphering the puzzling meanings and relationships between images and texts. Graphic designer professor, photographer, and author Jeffrey Conger has been providing a first-hand, behind the scenes view of motor sport photography for over the past 20 years. Having written and photographed for more than all the major motor sport publications, Conger produces vibrant depictions of racers, bikers, cars, and cycles. In Red Apples, Conger provided three images from his Salt Flats portfolio. Ceramic Professor, Josh DeWeese states, “I am inspired and challenged by the art of pottery and strive to make work that is successful on multiple levels. I want my pots to be well designed and comfortable to use; to be rich with ceramic wonder; seductive to behold; and to have reference to history and the field of ceramic art to spark the imagination.” DeWeese’s signature style investigates painting on three-dimensional forms, as can be seen by the five salt-fired jars in the exhibition. New this academic year, Graphic designer and architecture specialist, Ashley Fuchs engages questions of locality and environment through her work. By creating interactive pieces that facilitate both modern technology and older techniques, Fuchs attempts to acknowledge the locality of the gallery space and the local identity of the community. Ceramic professor, Jeremy Hatch, who also has an exhibition at Old Main Gallery in Downtown Bozeman, recontextualizes childhood iconography through his impeccable use of slip-casted porcelain. Like the fluidity of water, Gesine Janzen has a body of work that flows through the soul. A primarily woodblock printmaker, Janzen focuses largely on movement and line work through the bold lines of excavated wood grain. Coming off of her recent sabbatical, in Red Apples, Janzen has chosen a large scale Sumi ink watercolor from her body of work that researched “water” in all its forms in the Northwest. Though her painting medium of choice is encaustic, Painting professor Sara Mast, facilitates multiple mediums to provide the viewers an opportunity for exploration and discovery. Often collaborating with other artists or scientists, Mast uses animation, film, and sculpture to engage the viewer in interactive installations that are both entertaining and educational. Her CAVE collaboration will be on view in the new Norm Asbjornson Hall this spring. Through the expression of graphic design, print, and typography, Graphic design professor Meta Newhouse empowers her students to use graphic design to solve relevant problems. In her own work, Newhouse employs sense of nostalgia using letterpress to reference pop cultural such as her pieces Red Apple. In this exhibition, multiple letterpress pieces of movie titles in Italian are hung salon style, providing the viewer with glimpse of Newhouse’s masterful ability to pair type face with cinematic personality. When looking closely into the issues of popular culture, the plight of native people, and colonialism, one should look at the work of Metals professor, Bryan Peterson. Using sustainable materials such as tin, Petersen considers the cultural associations in his material choices with the over arching conceptual intention of his work. For Red Apples, Petersen is exhibiting jewelry that references the impacts of EPA deregulation though color and material. Through the innovative use of cold wax and oil paint that is applied and removed with clay tools, Gallery Director Ella Watson is inspired by local nature, though her work is autobiographical. In Red Apples, Watson is exhibiting two works she began during SLAM this past summer. However, her overall practice is becoming more socially and politically centered, as she has been inspired by MSU students in her role as co-advisor for the Black Student Union. Watson also has work on display at the YAM; her first year being included in the museum’s annual auction. With the works of Jim Zimpel, personal experience is translated from memory to sculpture. A master woodcrafter, Zimpel’s works are also autobiographical, though there is social commentary surrounding masculinity in his work. For Red Apples, Zimpel is presenting his newest creation: an 8’portable basketball hoop rendered in lumber—an exquisitely crafted piece that her created just for this exhibition. For more information on this exhibition, or on the Helen E. Copeland Gallery, please visit https://hecgallery.com or follow us on Facebook under the Helen E. Copeland Gallery. The Helen E. Copeland Gallery is located at 213 Haynes Hall on the second floor of Haynes Hall, across from the Aasheim Gate off of 11th, with the Ski Swing out front. Please note that the parking passes are required for parking during the business day (6AM-6PM). Gallery Hours: Monday-Friday, (9:00 AM – 5:00PM/ Closed on weekends. For more information, visit www.hecgallery.com, email the Gallery Director, Ella Watson at ella.watson@montana.edu, or call (406)994-4501 during business hours.